This past week I had the distinct pleasure to offer my insights at the annual CCIM Outlook Conference at Harborside Event Center. While I was waiting to speak I had the pleasure of sitting with Lawrence Yun, Chief Economist from NAR, and headline speaker at this year’s event. Dr Yun and I talked about economic forces that will affect SW Florida real estate. Lawrence and I chatted about what he sees affecting the SW Florida real estate market and the economy as a whole. He was kind enough to share his presentation so I thought I’d share a few of his slides and recap some of his thoughts. He was very bullish on housing as a way to develop wealth. He showed some slides that illustrated how much wealth Americans have today versus the past. One slide that caught my eye was a comparison of renters vs. homeowners. 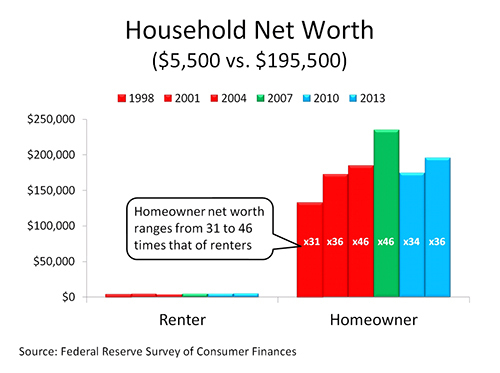 Homeowners have used their home to build wealth. Many homeowners have accumulated enough wealth to own their home and put money in the stock market. Most renters live paycheck to paycheck because they’re not accumulating wealth. This is one reason they’re not benefiting from a rising stock market either. Rents are rising and he sees rising rents for the foreseeable future. 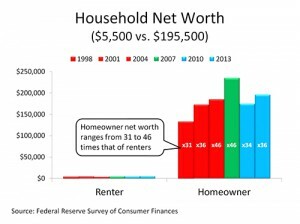 I really wish I could share all his graphs but suffice it to say buying a home makes a lot more sense than renting if you can qualify for a mortgage. 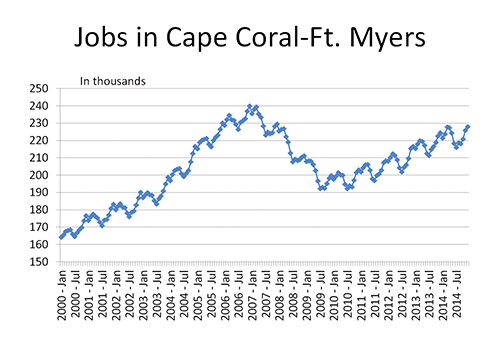 Dr Yun also shared a jobs graph for the Fort Myers – Cape Coral market. 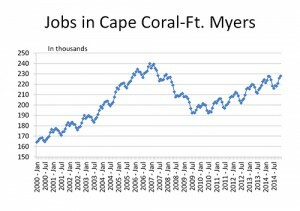 Jobs have been rising in the area since 2009. This is one reason our housing market has stabilized and has healed. Dr Yun expects treasury yields to increase .4% in 2015 and 1.3% in 2016. He predicts mortgage rates will be 6% by 2016 As we know, each 1% rise in interest rates takes away about 9% purchasing power for the buyer, so rising rates can put a squeeze on how much buyers can afford. Lower oil prices have helped to add purchasing power to today’s buyer, so if oil stays low, it could offset the negative affect of rising rates. He did say that if oil stays low that one of 3 leaders of Iran, Russia, or Venezuela would not survive. Lower oil prices are helping US consumers but it’s putting tremendous pressure on leaders of those countries. GDP has been below 3% for 9 straight years, so not everyone is feeling good times. We also have about 6 million less working in US than before the recession. Our economy is creating jobs but not fast enough. Dr Yun expects SW Florida to flourish for the next 3 years. We’re in a good spot and things are looking rosy. He didn’t predict after 3 years. He pretty much sums up what we’ve all been feeling here in SW Florida. Jobs are up, housing prices are rising, and things are looking better going forward. There are some things that may slow growth down, but for most part SW Florida is in for good times. Just don’t get used to 30% gains in real estate. Locally median single family home prices rose 8.6% in 2014, and that’s just fine with us. That’s a more sustainable climb than 30% every year. To search for your home on MLS go to www.Topagent.com If you’d like to sell you can also check out the site and get your home’s value. Remember to Always Call the Ellis Team 239-489-4042 We’ll handle you with care! Economic Forces That Will Affect SW Florida Real Estate. Rents are rising and will for the foreseeable future. Jobs have been rising in the area since 2009. Posted in Fort Myers Real Estate, Southwest Florida Real Estate.